First-ever 3 3/4-inch action figures based on The Big Bang Theory! She can be your bestie. Dr. Amy Farrah Fowler hails from The Big Bang Theory. 3 3/4-inch scale articulated action figure. Limited Edition of 2000 pieces with unique packaging that turns into a diorama to recreate your favorite scenes and is individually numbered! It's Dr. Amy Farrah Fowler from the super-popular sitcom The Big Bang Theory! Here she appears as a first-ever 3 3/4-inch scale action figure from Bif Bang Pow!. 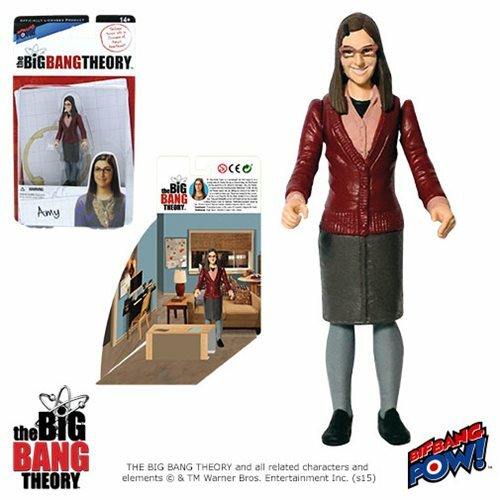 Made of plastic, The Big Bang Theory Amy Farrah Fowler 3 3/4-Inch Series 1 Action Figure features multiple points of articulation. Won't you please take her home so she can be your bestie? After all, she does have a Ph.D. in neurobiology. Ages 14 and up. But wait, there's more! Amy comes in totally unique full-color packaging that turns into a diorama that includes pop-up features. Pose your figure to recreate popular scenes from the show! Dr. Amy Farrah Fowler is a neurobiologist who first popped up as a possible match for Sheldon through an Internet dating site (that Howard and Raj signed him up for without his knowledge!). Amy, like Sheldon, is a genius who has previously avoided relationships. In fact, she only met Sheldon because she was fulfilling her promise to her mother to go on at least one date a year. Things have changed for Amy, however, as she is now living the life she always dreamed of as a pubescent teen. Penny and Bernadette are her best friends and she has succeeded in making Sheldon Cooper her boyfriend. (Relationship agreement penned by him, of course. Swoon!) She even shared a Valentine’s Day kiss with Dr. Cooper. Superpowers: Dissecting brains in the name of research, playing the harp. Weaknesses: High libido, Sheldon Cooper’s lips, tiaras.